Plussing sessions have been an element of past Young Makers seasons! Whether formal or casual, they provide an opportunity for project teams to share their ideas, progress, challenges, and next steps with the participants in the program on a monthly basis. (Plussing is a termed used at Pixar to mean “finding what’s good about an idea and making it even better”). In the first plussing session, don’t worry if projects are still at the very early stages! There will be time for progress and development in the coming months. If Young Makers do have something to share, consider bringing sketches or other visuals to help describe ideas. 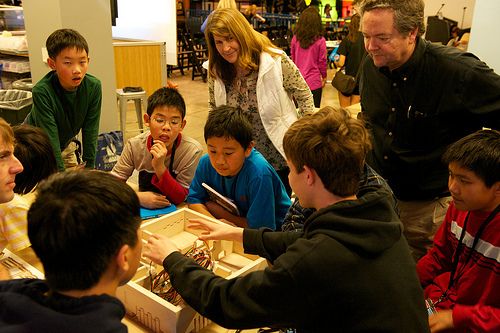 If Young Makers have several ideas for a project and haven’t yet decided upon one, consider briefly describing them all. If there are prototypes or work in progress, by all means, bring pictures, artifacts or other materials to talk over. Plussing sessions can be organized like little Maker Faires, where a bunch of people are sharing their work at the same time, with their materials laid out on a table for discussion as others pass by. What inspired you to pick this project? Do you know of other people who have done projects similar, or is this one-of-a-kind? What other project ideas have you toyed with? What kinds of projects have you built in the past? What do you think the hard parts are going to be? What are the easier parts? They provide a monthly deadline so that project teams aren’t faced with one huge deadline many months in the future. They give all teams a chance to see the creativity and breadth of ideas of the entire group, and teams can see other projects develop through the season. They give project teams a chance to talk about their failures in a positive and constructive way. They give project teams a chance to practice talking about their projects in advance of exhibiting at the Faire. They provide an opportunity for participants to get to know each other, helping to build the kind of community and culture we’re trying to promote.